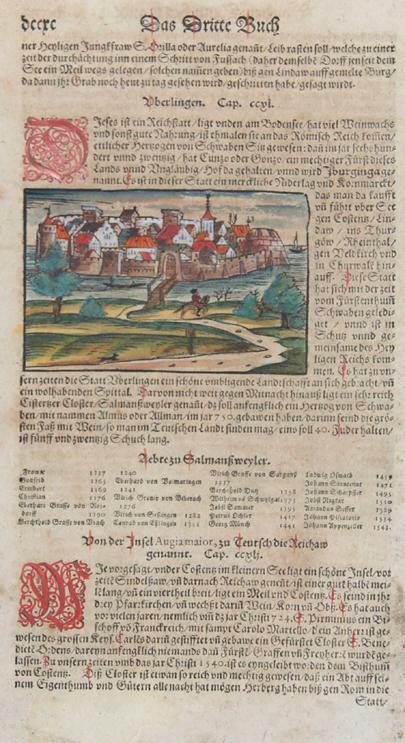 Artist: Münster Sebastian ca ; issued in: Basle; date: ca1550 - - technic: Woodcut; - colorit: original colored; - condition: Very good; - size (in cm): 26,5 x 14,5; - description: Map shows Ueberlingen at the Bodensee, on reverse view of a beekeeper of Lindau; - vita of the artist: Sebastian Münster (1488 ? 1552) belongs to the very important Comographers of the Renaicance. He issued his first famous Cosmographia in 1544 with 24 double paged maps with German description of the world. It had numerous editions in different languages including Latin, French, Italian, English, and Czech. The last German edition was published in 1628, long after his death. The Cosmographia was one of the most successful and popular books of the 16th century. It passed through 24 editions in 100 years. This success was due to the notable woodcuts , some by Hans Holbein the Younger, Urs Graf, Hans Rudolph Deutsch, and David Kandel. It was most important in reviving geography in 16th-century Europe. His first geographic works were Germania descriptio (1530) and Mappa Europae (1536). In 1540 he published a Latin edition of Ptolemy's Geographia with illustrations. The 1550 edition contains cities, portraits, and costumes. These editions, printed in Germany, are the most valued of the Cosmographias.